Wasps in the family Pompilidae are commonly called spider wasps or pompilid wasps. The family is cosmopolitan, with some 5,000 species in six subfamilies. All species are solitary, and most capture and paralyze prey, though members of the subfamily Ceropalinae are cleptoparasites of other pompilids, or ectoparasitoids of living spiders. In South America, species may be referred to colloquially as marabunta or marimbondo, though these names can be generally applied to any very large stinging wasps. Furthermore, in some parts of Venezuela and Colombia, it is called matacaballos, or "horse killers", while in Brazil some particular bigger and brighter species of the general marimbondo kind might be called fecha-goela/cerra-goela, or "throat locker". Like other strong fliers, pompilids have a thorax modified for efficient flight. The metathorax is solidly fused to the pronotum and mesothorax; moreover, the prothorax is best developed in Pompilidae and Scoliidae because wasps in these families use their forelegs to dig. Pompilids typically have long, spiny legs; the hind femur is often long enough to reach past the tip of the abdomen. The tibiae of the rear legs usually have a conspicuous spine at their distal end. The first two segments of the abdomen are narrow, giving the body a slender look. The pompilid body is typically dark (black or blue, sometimes with metallic reflections), but many brightly colored species exist. From a lateral view, its pronotum looks rectangular and it extends back to the tegulae, near the base of the wings. Most species are macropterous (having long wings), but a few brachypterous (short-winged) and apterous (no wings) species are known. Spider wasps are best distinguished from other vespoid wasps in having (in most species) a transverse groove bisecting the mesopleuron (the mesepisternal sclerite, a region on the side of middle segment of the thorax above the point where the legs join). Like other Vespoidea, they have antennae with 10 flagellomeres in the female and 11 in the male. Most Pompilidae have straight inner eye margins. The hind wings do not have a distinct claval lobe, but they have a distinctive jugal lobe. The hind leg has a tibial spur with a tuft or row of fine hairs. The legs are long and slender with the tips of the tibia (metatibia) long enough to extend beyond the tip of the abdomen (metasoma). Sexual dimorphism is not pronounced, although females are often larger than the males. Coloration and wing appearance vary greatly among the many species. General coloration is aposematic (warning off predators), generally based on black, often with markings of orange, red, yellow, or white. Larvae can also be identified by physical examination. Spider wasps are solitary wasps that use a single spider as a host for feeding their larvae. They paralyze the spider with a venomous stinger. Once paralyzed, the spider is dragged to where a burrow will be built – some wasps having already made a nest. A single egg is laid on the abdomen of the spider, and the nest or burrow is closed. Spider wasps protect their nests by putting dead ants into the outermost chamber, the chemicals within deterring predators. The size of the host can influence whether the wasp's egg will develop as a male or a female; larger prey yield the (larger) females. A complex set of adult behaviors can then occur, such as spreading soil or inspecting the area, leaving the nest site inconspicuous. When the wasp larva hatches, it begins to feed on the still-living spider. After consuming the edible parts of the spider, the larva spins a silk cocoon and pupates, usually emerging as an adult the next summer. Some ceropalines lay the egg on a still-active spider, where it feeds externally on hemolymph. In time, that spider will die, and the mature wasp larva will then pupate. Currently, the Pompilidae are split unequally into six subfamilies throughout most of the world. Ceropalinae and Notocyphinae contain two genera each and occur in Central and South America and the Oriental region. The Epipompilinae contain a single genus and occurs in the Neotropics, the Australasian region, and the Afrotropical region. The Ctenocerinae contain two genera in the Neotropics, four in Australia and 11 in Africa. Pepsinae and Pompilinae are the most diverse, and the remaining genera are split between them. As mentioned above, the Pompilidae get their common name, "spider wasps", from their notable behavior of hunting and killing spiders, often larger than themselves, as food for their larvae. They provide each of their larvae with a single prey/host, which must be large enough to serve as its food source throughout its development. Pepsis thisbe of the southwestern United States exhibits a direct correlation between adult wasp body length and the weight of its host spider, Aphonopelma echina. Because the size of a P. thisbe adult is determined by the size of the host provided for it by its mother, the seasonal frequency of host sizes implicitly will determine the size variation in adult wasps. Because of the large body size of their prey, pompilids usually will either construct burrows near the site of attack or use the host’s own burrow or tunnel. The paralyzed spider is concealed in a burrow so larva can develop without disruption by other parasites or scavengers. Some pompilids only temporarily paralyze their hosts, which regain activity before being killed by the maturing wasp larva. In another study on Pepsis thisbe, chemosensory cues were shown to be used to detect specific hosts. Specific chemosensory cues attract the wasp to its prey, Aphonopelma echina, despite other host spiders of the same size and frequency being present. 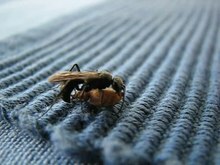 In studies on Pepsis grossa (formerly P. formosa), a pompilid of the southwestern United States, the wasps were found to have behavioral plasticity. Their hunting behavior concerning their host Rhechostica echina improved with experience. The time required to complete all behavioral components decreased with each spider killed. Concerning mating behavior, males acquire perch territories to scan for incoming receptive females. In studies on the tarantula wasp Hemipepsis ustulata, larger males are more likely to acquire perch territories and territorial males appear to increase their chances of mating because receptive females fly to perch sites held by said males. Unlike many other families in the order Hymenoptera, wasps in this family are solitary and nest alone. 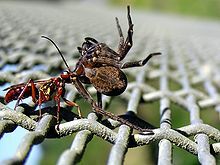 A female wasp searches the ground and tree trunks for a spider, and upon finding one, stings it, paralyzing the spider. Once the spider is paralyzed, the female wasp makes a burrow or takes the spider to a previously made burrow. She lays a single egg on the abdomen of the spider, and then encloses the spider in the burrow. The egg hatches and the larva feeds on the spider, breaking through the integument with its mandibles. The larva has five instar stages before it pupates; no major morphological differences are noted between the first four instars, with the exception of size. At the conclusion of the final instar, the larva spins a silky cocoon, where it emerges as an adult either later in the same summer season or overwinters, depending on the species and the time of year the larva pupates. Adult Pompilidae are nectar-feeding insects and feed on a variety of plants, mostly leaves of the eucalyptus tree. The female wasps search for a variety of spiders for their larva to feed on, including wolf spiders (Lycosidae), huntsman spiders (Sparassidae), and baboon spiders (Harpactirinae). As the larva feeds on its host, it saves the vital organs, such as the heart and central nervous system, for last. By waiting until the final larval instar, it ensures the spider will not decompose before the larva has fully developed. In 1984, Justin O. Schmidt, a researcher from Arizona, developed a hymenopteran sting pain scale, now known as the Schmidt sting pain index. In this index, a 0 is given to a sting from an insect that cannot break through human skin, a 2 is given for intermediate pain, and a 4 is given for intense pain. The scale rates stings from 78 different species in 42 different genera. Spider wasps of the genus Pepsis, also known as tarantula hawks, have a sting rating of 4. The sting is described as "blinding, fierce, and shockingly electric. A running hair dryer has been dropped into your bubble bath." Only the sting of the bullet ant, Paraponera clavata, is ranked higher, with a 4+ rating. Spider wasp being carried off by ants. A Western Australian pompilid has captured a large huntsman spider. A pompilid has captured a spider in Quito, Ecuador. The anaesthetised spider is carried up to a nest in the roof. A spider wasp is dragging its captured prey in Sydney, Australia. ^ Costa, Fernando G.; Pérez-Miles, Fernando; Mignone, Antonio (April 2004). "Pompilid Wasp Interactions with Burrowing Tarantulas: Pepsis cupripennis versus Eupalaestrus weijenberghi and Acanthoscurria suina (Araneae, Theraphosidae)" (PDF). Studies on Neotropical Fauna and Environment. 39 (1): 37–43. doi:10.1080/01650520412331270945. ISSN 0165-0521. OCLC 231044349. Retrieved 20 April 2012. ^ a b c Pitts, James P.; Wasbauer MS & von Dohlen CD (2005). "Preliminary morphological analysis of relationships between the spider wasp subfamilies (Hymenoptera: Pompilidae): revisiting an old problem". Zoologica Scripta. 35 (1): 63–84. doi:10.1111/j.1463-6409.2005.00217.x. ^ a b Goulet, H; Huber, JT, eds. (1993). Hymenoptera of the world: an identification guide to families. Agriculture Canada. pp. 202–205. ^ a b Daly, Howell V.; Doyen, John T.; Purcell, Alexander H. (1998). Introduction to Insect Biology and Diversity. Oxford: Oxford UP. ISBN 978-0-19-510033-4. ^ "Dead-ant wall protects young spider wasps". Science News. 2014-07-07. Retrieved 2014-07-11. ^ Staab, Michael; Ohl, Michael; Zhu, Chao-Dong; Klein, Alexandra-Maria (2014-07-02). "A Unique Nest-Protection Strategy in a New Species of Spider Wasp" (PDF). PLOS ONE. 9 (7): e101592. doi:10.1371/journal.pone.0101592. ^ "Spider predators and parasites". Iziko Museums of Cape Town: museums.org.za. Retrieved 28 November 2006. ^ a b Punzo, F. 1994. The biology of the spider wasp, Pepsis thisbe (Hymenoptera: Pompilidae) from Trans Pecos, Texas. I. Adult morphometrics, larval development and the ontogeny of larval feeding patterns. Psyche 101: 229-242. ^ Punzo, F. and Ludwig, L. 2005. Behavioral Responses of Pepsis thisbe (Hymenoptera: Pompilidae) to Chemosensory Cues associated with host spiders. Journal of Insect Behavior 18: 757-766. ^ Punzo, F. and Garman, B. 1989. Effects of encounter experience on the hunting behavior of the spider wasp, Pepsis formosa (Say) (Hymenoptera: Pompilidae). The Southwestern Naturalist 34: 513-518. ^ Alcock, J. & Kemp, J. 2006. The behavioral significance of male body size in the Tarantula Hawk Wasp Hemipepsis ustulata (Hymenoptera: Pompilidae). Ethology 112: 691-698. ^ Punzo, F. 2005. Studies on the natural history, ecology, and behavior of Pepsis Cerberus and p. mexicana (Hymenoptera: Pompilidae) from Big Bend National Park, Texas. Journal of the New York Entomological Society, 113(1): 84-95. ^ Berenbaum, M. 2003. A Stinging Commentary. American Entomologist,49(2): 68-69. ^ "Tarantula Hawks Deliver The Big Sting - Wry Heat". Tucsoncitizen.com. 2010-07-16. Retrieved 2013-03-15. Wikimedia Commons has media related to Pompilidae.